The capital of Santorini, Fira is located on the west side of the island and it is built on top of cliffs, 250 meters from the sea, giving you the most amazing feeling that you are at the top of the world! In the end of the 18th century, the residents of Santorini had to leave the old capital of the island Pyrgos, and Fira became their new capital. Of course the earthquake in 1956 totally destroyed a part of the town and only a small part of the 18th century buildings survived the earthquake forming the today's island's shape that has stolen every traveler's heart. 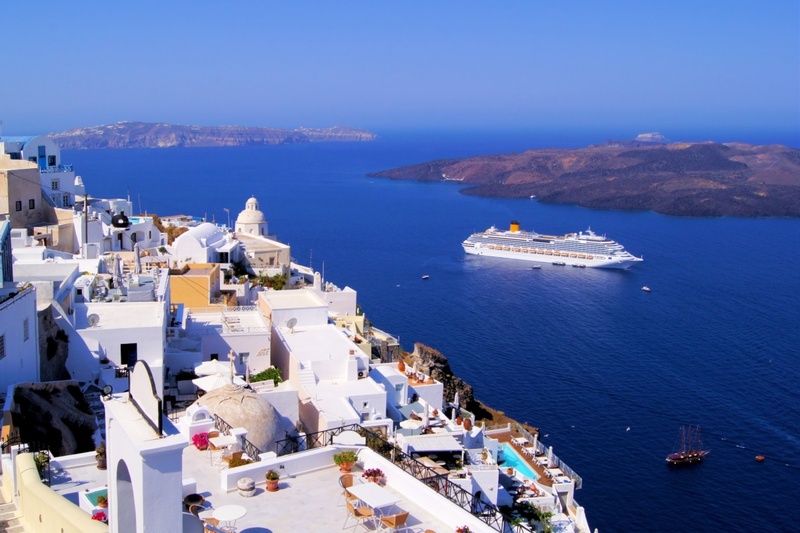 The amazing and panoramic view that you get when in the capital of Santorini will make even the non romantic ones to fall in love with this stunning greek island. If you are a greek island lover or you wish to see what the whole world is talking about then in Santorini let the white houses with the blue doors create an amazingly summer scenery that you will not find easily. Besides it is not a secret that many tourists visiting the island for holidays have decided to leave their hometowns and become permanent residents of this amazing island! Walk around Theotokopoulou Square that is the main square of Fira and find anything you need there from shops, jewelries, cafes, restaurants, bars and taverns as well as night clubs for the party lovers. Here it is where your heart will beat very fast as there is not a thing that you will not love about this island. It is considered to be an ideal destination for the romantics wishing to experience the most amazing holidays with their other half but also it is an ideal destination if you are traveling with your friends and family. In Fira you will find everything you need and the main road of 25 Martiou is filled with travel agencies as well as the bus and the taxi stations are also located here if you wish to find where to star from your discovery journeys. Try the local cuisine, drink the local wine and let yourself relax and unwind in the most amazing scenery that is created by this rocky and yet so blue and white island! Find information about selected Hotels, apartments and rooms in Fira to choose the perfect place for your accommodation.